Pennsylvania Civil War Era Newspaper Collection contain all the words, photographs, and advertisements from selected newspapers published during the pivotal years before, during, and after the U.S. Civil War. 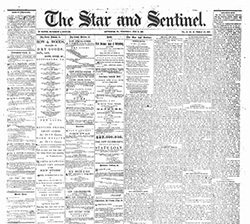 Newspapers played a prominent role in the conflict. They helped mobilize public opinion for, or against, the war, relayed battlefield developments to their readers, and documented political life on the homefront. Beyond military or political concerns there is much on cultural topics including travel, arts and leisure, sports and contests, and local social events. Where there are gaps noted please refer to the Browse Archive to determine the exact lapses in holdings. In some instances variant titles are listed under one main title.